← Do you love the Lord as much as you love the grocer? When you are in the spirit world, everything there will appear as natural as things now do. Spirits will be familiar with spirits in the spirit world—will converse, behold, and exercise every variety of communication with one another as familiarly and naturally as while here in tabernacles. There, as here, all things will be natural, and you will understand them as you now understand natural things. You will there see that those spirits we are speaking of are active; they sleep not. And you will learn that they are striving with all their might—laboring and toiling diligently as any individual would to accomplish an act in this world (Discourses of Brigham Young, 380). What does taken home to God mean? These words of Alma as I understand them, do not intend to convey the thought that all spirits go back into the presence of God for an assignment to a place of peace or a place of punishment and before him receive their individual sentence. “Taken home to God,” simply means that their mortal existence has come to an end, and they have returned to the world of spirits, where they are assign-ed to a place according to their works with the just or with the unjust, there to await the resurrection. “Back to God” is a phrase which finds an equivalent in many other well known conditions. …In the question of spirits returning to God, Pres. George Q. Cannon has made the following comment: Alma, when he says that “the spirits of all men, as soon as they are departed from this mortal body…are taken home to that God who gave them life,” has the idea doubt-less, in his mind that our God is omnipresent not in His own personality but through His minister, the Holy Spirit. He does not intend to convey the idea that they are immediately ushered into the personal presence of God. He evidently uses that phrase in a qualified sense…. Solomon, makes such a similar statement: “Then shall the dust return to the earth as it was: and the spirit shall return unto God who gave it.” (Eccl. 12:7) The same idea is frequently expressed by the Latter day Saints. (Joseph Fielding Smith Jr., Answers to gospel questions, 2:85) see Alma 40:11. The postmortal spirit world is an actual place where spirits reside and “where they converse together the same as we do on the earth” (TPJS, p. 353). “Life and work and activity all continue in the spirit world. Men have the same talents and intelligence there which they had in this life. They possess the same attitudes, inclinations, and feelings there which they had in this life” (Bruce R. McConkie, Mormon Doctrine, p. 762). When you lay down this tabernacle, where are you going? Into the spiritual world…Where is the spirit world? It is right here. Do the good and evil spirits go together? Yes they do…. Do they go beyond the boundaries of the organized earth? No, they do not…. Can you see it with your natural eyes? No. Can you see spirits in this room? No. Suppose the Lord should touch your eyes that you might see, could you then see the spirits? Yes, as plainly as you now see bodies (Discourses of Brigham Young, ed. John A. Widtsoe, pp. 376-81). “A wonderful work is being accomplished in our temples in favor of the spirits in prison. I believe, strongly too, that when the Gospel is preached to the spirits in prison, the success attending that preaching will be far greater than that attending the preaching of our Elders in this life. I believe there will be very few indeed of those spirits who will not gladly receive the Gospel when it is carried to them. The circumstances there will be a thousand times more favorable” (Lorenzo Snow, Millennial Star, Jan. 22, 1894, 50). In a funeral sermon, Joseph Smith declared that the spirits of righteous people who have died “are not far from us, and know and understand our thoughts, feelings, and emotions, and are often pained therewith” (Teachings of the Prophet Joseph Smith, p. 326). “Sometimes the veil between this life and the life beyond becomes very thin. Our loved ones who have passed on are not far from us” (President Ezra Taft Benson, Conference Report, Apr. 1971, p. 18; or Ensign, June 1971, p. 33). The postmortal spirit world is a place of continued preparation and learning. In this sense, it is an extension of mortality. Those who have died without an opportunity to hear the gospel of Jesus Christ will have opportunity to hear and accept it in the spirit world. “The great work in the world of spirits is the preaching of the gospel to those who are imprisoned by sin and false traditions” (Mormon Doctrine, p. 762). The faithful elders and sisters who depart this life “continue their labors in the preaching of the gospel of repentance and redemption…Among those who are in darkness” (D&C 138:57; Smith, p. 461; see also Salvation of the Dead). 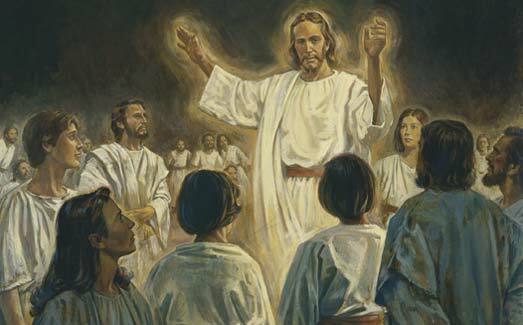 An important LDS doctrine states that Jesus Christ inaugurated the preaching of the gospel and organized a mission in the spirit world during his ministry there between his death and resurrection. This is the substance of a revelation recorded as Doctrine and Covenants section 138. Since Jesus’ visit there, the gospel has been taught vigorously in the spirit world (see Spirit Prison). The relative conditions and state of mind in the two spheres of the postmortal spirit world are described by the Prophet Joseph Smith: “The spirits of the just are exalted to a greater and more glorious work; hence they are blessed in their departure to the world of spirits. Enveloped in flaming fire, they are not far from us, and know and understand our thoughts, feelings, and motions, and are often pained therewith” (TPJS, p. 326). On the other hand, “The great misery of departed spirits in the world of spirits, where they go after death, is to know that they come short of the glory that others enjoy and that they might have enjoyed themselves, and they are their own accusers” (Teachings of the Prophet Joseph Smith, p. 310-11). This entry was posted in Plan of Salvation and tagged death, Heavenly Father, Jesus Christ, Plan of Salvation, relevance of the scriptures, temples, The Spirit World, Work for the dead. Bookmark the permalink. Thank you for the time you take in creating and maintaining this blog. I enjoy reading your posts. Thanks so much! I will be getting more material on this site this year, and hopefully it will be easier to find what you are looking for as I have put some menus on this site to make things more organized. I appreciate you checking this site out! Have a super day!